As he tries to get accepted into the “Good Bird Club,” he shifts from “happy to be me” to hanging his feathered beak with insecurity and scuffling his giant orange clompers in ‘not good enough’ mode…Before you roll your eyes at Sesame Street’s bullying prevention program as yet another media bandwagoning effort taking place in October for National Anti-Bullying Awareness Month, understand that Sesame Workshop’s preschool crowd is a perfect “show-n-tell” community to inject pro-social learning to show ‘right from wrong’ from the get go, as prevention vs. intervention. “Isn’t that a parenting job?” Yes…AND a societal one, to role model social emotional learning and what is and isn’t acceptable in an increasingly coarse culture of snark tanks and sarcasm. How are kids supposed to figure out social norming when “everyone’s doing it” drops the limbo pole to a new level of low? You can say that again. When Sesame Street itself comes out with a bullying program only to be hacked and bullied by some rogue hijacking hipster being XXXtremely non-kid friendly shutting the Sesame YouTube channel down to mop up the mess (really YouTube, you need to put some of your profits into security and moderation methodology) it does make you think that literally EVERYone is in a race to the bottom to say how ‘outrageous’ they can be for their 15 minutes of bullying, mean-spirited media fame. 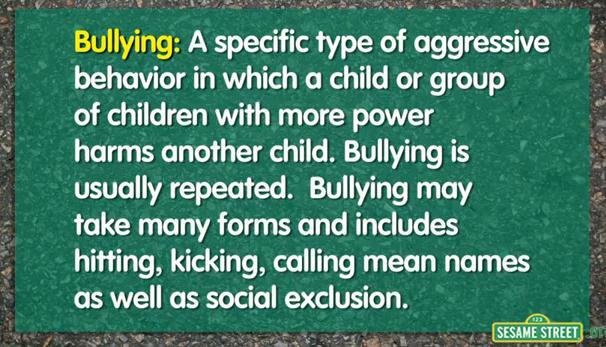 But isn’t bullying “just a rite of passage? Aren’t we hot-housing kids? Isn’t it better to teach your kids to stick up for themselves than be a wimp? They’ll need these skills in the real world”…yadayada…? Sesame Workshop proceeds to refute “perception vs reality” of today’s bullying (cyber, schoolyard, sibling, and home life) backed by resources, facts, and finite examples that almost seem to slide off the “most popular FAQ list ”of every parent education event I’ve attended. What’s the difference between teasing and bullying? We see this in play relationships akin to adults’ sarcasm…When teasing is occasional, mutual, and even name-calling in friendly/back and forth joshing it’s one thing, when it shifts to intent to harm or hurt, is done so repeatedly, with a power/dynamic that shifts, via put downs or one-way dominance exerting control (one primary party feels badly, isolated) it’s bullying. Is a forced “sorry” appropriate? No, it’s important to ‘show NOT tell’ in order to make up for the hurt feelings, otherwise the insincerity can further revictimize the child, reliving the instance…they need to be ‘ready to accept’ the overture, when it’s offered with genuine amends. These are the types of questions the Sesame Workshop parenting videos address…all those “I was just wondering that” moments put to media like a mental relay on record. 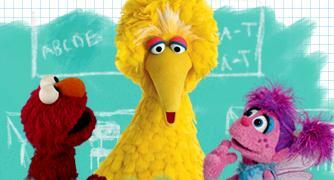 Whether it’s learning to understand a child’s ‘bystander guilt’ or coaching adult peers on how to set up school climates, clubs, teams, or communities that aren’t corrosive, the tips offered using the Sesame Workshop scenarios bring heightened awareness and pragmatic solutions without buying into ‘alarmist’ media hype of “bullying explosions” and “skyrocketing” superlatives. My concern, given our amped and ramped decibel level of media volume is that all the ‘talk’ about bullying will begin to desensitize folks into ‘bullying burnout’ where we turn a deaf ear onto the reality of the problem instead of listening, affirming, and discerning the nuance. It doesn’t take a newspaper headline or ‘bullycide’ to wound and damage to the core and get children off on the wrong foot, so prevention rather than intervention (much like health/wellness and nutrition habits) are much easier to set early on than ‘counter-act’ later. Sesame Workshop has done a great job leveraging the dilemmas and some problem-solving role play solutions in their familiar charismatic storytelling style…with talking points about the show that read like an age-appropriate media literacy cheat sheet. 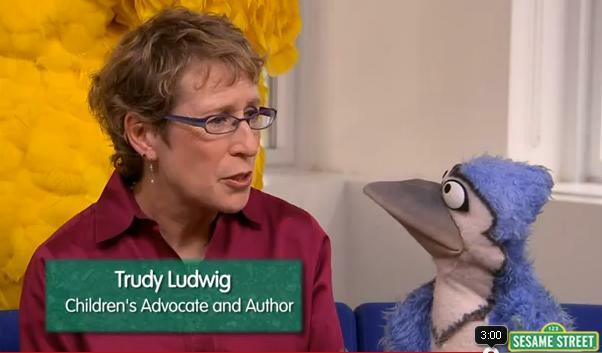 Any child care provider from babysitter to sleepover host can use these “watch and discuss” teaching moments, along with the Good Birds Club show in its entirety and related kidvid fun. As for parents? The guest panel of experts is well worth the 5-10 minute segments of run time in each one. Have at it! 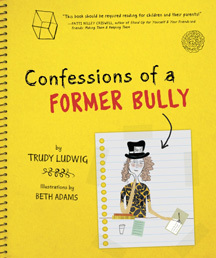 Meanwhile, here are just a few tips below from Trudy Ludwig’s fictional Confessions of a Former Bully book, one of many in her social emotional learning series. She has a new one out called “Better Than You” all about bragging, arrogance, and empathy to deconstruct the messages served up in sports and play yards regularly…I think I’ll interview her on that separately. She uses her fiction books as her medium of choice, bringing characters to life that kids can relate to while weaving in hands-on life skills and usable teaching moments that are grounded in research-based social emotional learning. “I knew he couldn’t help it, but that didn’t stop me from rolling my eyes and laughing. Mr Randall looked mad. In the back she has a great resource list with some fabulous books for adults AND for kids along with studies cited, organizations, websites and more. …Keep your eyes, ears and heart open to receive whatever those wee ones are trying to tell you. I’m so glad you wrote about this and so happy that Sesame Street is doing this. As a mother of an almost-4-year-old, it has surprised me how early the teasing starts, and the role playing around excluding, comparing, and competing. It is more than wonderful that a trusted and beloved source is tackling so much of this in an age appropriate way that’s helpful for the children and their parents. Having just written the Veterans Day 11-11-11 post, I included their program for military families adjusting to deployment abroad, or soldiers returning home w/all the changes therein, etc. too…pretty amazing use of media for socio-emotional support for kids.